After almost an entire week without baseball I was definitely experiencing some withdrawal, so I was glad to see the Angels come to town for a big three game series to open up the second half. It was hard to predict this series. The Angels always play the Yankees tough and, coming into this series the two teams had split six games. In the end, the Yankees took two out of three from the Halos, which is really all you can ask for when you’re facing the second hottest team in the league over the last couple of months. I’m not sure why, but I’ve never been fully sold on C.J. Wilson. I mean I recognize his talent, and I have him on my fantasy team, but I feel like he hasn’t shown that he’s a true “Ace” yet. Maybe it’s because he got blow out in the World Series last year… I really don’t know. Anywho, he was going up against Hiroki Kuroda in this one, so I expected a nice little pitcher’s duel. As John Sterling says, “that’s baseball, Suzyn,” and there was no duel at all. This was a weird game for Hiroki fans. He gave up a solo home run to Erick Aybar in the top of the third, and then didn’t allow anything else until the top of the seventh, when Mark Trumbo hit a three-run home run over the left-center field bullpen to give the Angels a 4-2 lead. That was the big blow that basically ruined Kuroda’s line score for the night, but the Angels would tack on another run in the top of the eighth against Hiroki. His final line looked like this: 7.1 Ip, 8 hits, 5 runs, 1 BB, 6 Ks, 101 pitches and a no-decision. Chad Qualls came in to finish the eighth inning and, after the big comeback in the bottom of the eighth, he got his first Yankees win of the season. Rafael Soriano came in in the bottom of the ninth for his 21st save of the season, and the Yankees had a big win in game one. If it wasn’t for Mark Teixeira, the Yankees would have had another one of those frustrating RISP fail losses that I’ve been ranting about all season long on this blog. Overall, they went 2-11 with runners in scoring position, but a win makes everything ok. The game winning hit came from Russell Martin in the bottom of the eighth inning, but the Yankees wouldn’t have been anywhere near the position to score that run without Tex. The Angels took a 1-0 lead in the top of the third, but it wouldn’t last very long. Jeter hit a one-out single and Granderson struck out, which brought Tex up. Wilson threw him a low fastball, and Tex went down and got it, lacing a line drive over the left field fence for a two-run homer to give the Yankees a 2-1 lead. The Yankees wouldn’t score again until the bottom of the eighth, and Tex had a lot to do with that as well. The Angels pulled Wilson after the seventh in favor of Scott Downs, who came into the game with an ERA of 0.30. Naturally, the Yankees jumped all over him. Jeter opened the inning with a double and Granderson walked, which again brought up Tex. Up to that point, the Yankees were hitless with RISP, but Tex changed all that. Downs threw him a hanging breaking ball, and Tex crushed it over the left field wall for a game-tying three-run home run. The next two batters got out before Nick Swisher walked and was pinch-run for by Dewayne Wise, who stole second. Raúl Ibañez then walked to bring up Martin, who hit a soft line-drive down the left-field line to give the Yankees the 6-5 lead, which is how the game would end. Game two was really the wild card game of this series. The Yankees sent Freddy García to the mound, and the Angels countered with Jerome Williams. This game could have ended 1-0, or 11-10, and I wouldn’t have been surprised either way. In the end, both pitchers battled pretty hard, but the Yankees edged the Angels out 5-3, using mostly home runs to get the victory. This wasn’t an ideal start by García. He struggled mightily threw five innings, and needed 98 pitches to get through them, but he held the Angels to just three runs, and did what he needed to do to get the ball to the Yankees bullpen for the win. Freddy allowed two runs in the top of the first and one in the fourth, but it could have been a lot worse. The Angels left nine men on base in this game. In the end, Freddy’s line looked like this: 5 Ip, 5 H, 3 R, 5 BBs, 4 K, 98 pitches and his fourth win of the season. Good effort, Freddy! Hats off to the Yankees bullpen in this one. Freddy needed to be picked up, and they did it. Cody Eppley started it off with two scoreless innings, David Robertson pitched a scoreless eighth and Soriano came in to close things out again in the ninth. It was Soriano’s 22nd save in 23 chances, and he lowered his ERA to 1.51. He really has been a savior (pun intended) since Rivera’s injury. Not a terribly exciting game from an offensive standpoint. After García gave up two in the top of the first, the Yankees answered back in the bottom, when Robinson Canó hit an opposite field home run to left-center to tie things up at two. 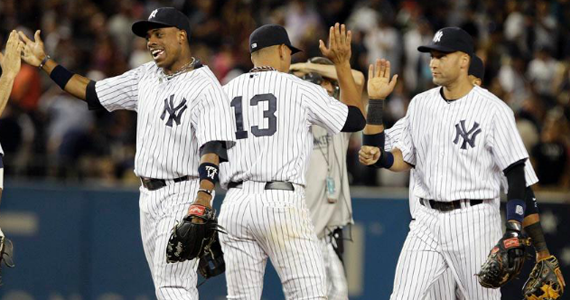 In the bottom of the third, Curtis Granderson chipped in a two-run homer of his own, and the Yankees had a 4-2 lead. Canó singled in the fifth run in the bottom of the sixth, and that was it. Outside of the two mistakes to Canó and Granderson, Williams held the yankees at bay for most of the game. The Angels just couldn’t break through. It was not a pretty outing for Nova, who came into this game undefeated in the second half in his career. All good things must come to an end, however. He went back to his early April ways, allowed three home runs, and took the first second half loss of his career. The Angels jumped on him early, with back-to-back solo home runs by Aybar and Albert Pujols in the top of the first, and later allowed Maicer Izturis to hit his first home run of the season (it was a two-run homer) in the top of the sixth. For some reason, Nova was allowed to go out and pitch the seventh, and he allowed another run. In the end, his line looked like this: 6+ Ip, 9 H, 6 R, 2 BBs, 3 Ks, 101 pitches and his fourth loss of the season. The bullpen let this game away, plain and simple. Some of it was probably due to some mismanagement by Joe Girardi, and his intense love affair with Qualls (can that guy pitch in some more games??). At the end of the day, it was guys not getting outs. Qualls got out of the seventh, but was left in for the eighth (Joe didn’t want to use Robertson for some reason), Boone Logan returned form the break with a couple of outs, and D.J. Mitchell gave up the required bomb to Trumbo. It’s tough to win when you give up ten runs. This was an exciting offensive game for the Yankees, and they showed the Angels that no lead was safe, no matter who was pitching. Jered Weaver had allowed five home runs all season coming into this start. They Yankees touched him up for three in his seven innings. After the Angels had taken their 2-0 lead in the top of the first, A-Rod followed a Granderson single with a two-run bomb to right-center to tie the game in the bottom of the frame. In the bottom of the sixth, after the Angels had taken a 5-3 lead, Granderson popped one over the right field fence to pull the Yankees to within one run. After the Angels extended their lead in the top of the seventh, Eric Chavez hit a solo home run to pull the Yankees back to one run again in the bottom of that inning. After the Angels went up 10-5 late, the Yankees at least needed five runs in the bottom of the ninth to stay alive. They almost pulled it off, but fell just short. The Angels put in their closer, Ernesto Frieri, in to pitch despite it not being a save opportunity. Frieri’s numbers coming into this game were borderline ridiculous. In 26.1 innings, he hadn’t allowed a run and had racked up 45 Ks. The Yankees, of course, pooped all over him in this one. He started the inning by walking Canó, before Tex came up and hit a two-run bomb to right to cut the Angels lead to 10-7. Frieri then walked Swisher and threw a ball to Ibañez before Mike Scoscia pulled the plug and brought in Downs. Ibañez singled off of Downs’ leg, but Downs rebounded to strike out Andruw Jones and induce a fielder’s choice groundout from Martin before walking Jeter to load the bases for Granderson. Granderson had a great at bat, nearly winning the game with a Grand Slam (it hooked just foul down the right field line) before walking to make it a 10-8 game for A-Rod. Scioscia countered with Kevin Jepsen and, predicatbly, he got A-Rod to pop out on a fastball to end the game. It wasn’t a win, but the Yankees won the series and showed the Angels that there would be no easy wins this season, and they can get to any pitcher, whether he’s one of the best starters in baseball, or one of the best relievers. No one is safe. This was a solid series win for the Yankees. Going into the break, the Angels were the second hottest team in baseball (just behind the Yankees), and will probably end up winning one of the Wild Card spots in the American League, so it was important to send them a message. The Yankees did just that, taking two out of three and knocking around Weaver, Frieri and Downs (three of the Angels’ best arms). Bring on Toronto!